The indication of the system's presence are the letters "AIR BAG" embossed on the air bag pad cover on the steering wheel and the passenger's side front panel pad above the glove box. The purpose of the SRS is to provide the vehicle's driver and/or the front passenger with additional protection than that offered by the seat belt system alone in case of a frontal impact of sufficient severity. The SRS uses sensors to gather information about the driver's and front passenger's seat belt usage and impact severity. If the occupant detection system is not working properly, the SRS air bag warning light on the instrument panel will illuminate because the SRS air bag warning light is connected with the occupant detection system. If the SRS air bag warning light does not illuminate when the ignition switch is turned to the ON position, remains illuminated after approximately 6 seconds when the ignition switch is turned to the ON position, or if it illuminates while the vehicle is being driven, have an authorized Kia dealer inspect the advanced SRS air bag system as soon as possible. The seat belt buckle sensors determine if the driver and front passenger's seat belts are fastened. These sensors provide the ability to control the SRS deployment based on whether or not the seat belts are fastened, and how severe the impact is. The advanced SRS offers the ability to control the air bag inflation with two levels. A first stage level is provided for moderate-severity impacts. A second stage level is provided for more severe impacts. The passenger’s front air bag is designed to help reduce the injury of children sitting close to the instrument panel in low speed collisions. However, children are safer if they are restrained in the rear seat. Modification to the seat structure can cause the air bag to deploy at a different level than should be provided. Do not place any objects underneath the front seats as they could damage and/or interfere with the occupant detection system. Manufacturers are required by government regulations to provide a contact point concerning modifications to the vehicle for persons with disabilities, which modifications may affect the vehicle’s advanced air bag system. That contact is Kia’s tollfree Customer Assistance center at 1-800-333-4Kia. However, Kia does not endorse nor will it support any changes to any part or structure of the vehicle that could affect the advanced air bag system, including the occupant detection system. Specifically, the front passenger seat, dashboard or door should not be replaced except by an authorized Kia dealer using original Kia parts designed for this vehicle and model. Any other such replacement or modification could adversely affect the operation of the occupant detection system and your advanced air bags. For the same reason, do not attach anything to the seat, dashboard or door, even temporarily. If the system is adversely affected, it could cause severe personal injuries or death in a collision. Be sure to read information about the SRS on the labels provided on the sunvisor. ABC – Always Buckle Children in the 2nd Row seat. It is the safest place for children of any age to ride. Do not allow a passenger to ride in the front seat when the PASSENGER AIR BAG “OFF” indicator is illuminated, because the air bag will not deploy in the event of a moderate or severe frontal crash. No objects should be placed over or near the air bag modules on the steering wheel, instrument panel or the front passenger's panel above the glove box, because any such object could cause harm if the vehicle is in a crash severe enough to cause the air bags to deploy. Never place covers, blankets or aftermarket seat warmers on the passenger seat as these may interfere with the occupant detection system. If the SRS air bag warning light remains illuminated while the vehicle is being driven, have an authorized Kia dealer inspect the air bag system as soon as possible. 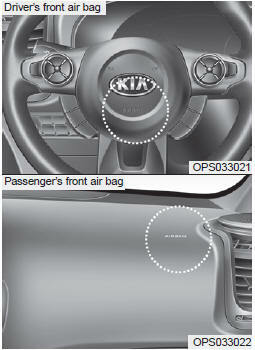 Air bags can only be used once – have an authorized Kia dealer replace the air bag immediately after deployment. 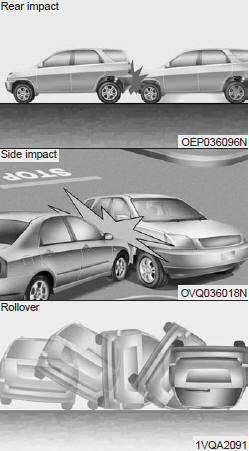 Front air bags are not intended to deploy in side-impact, rear-impact or rollover crashes. In addition, front air bags will not deploy in frontal crashes below the deployment threshold. Even though your vehicle is equipped with the occupant detection system, do not install a child restraint system in the front passenger seat position. A child restraint system must never be placed in the front seat. The infant or child could be severely injured or killed by an air bag deployment in case of an accident. Sitting improperly or out of position can result in serious or fatal injury in a crash. All occupants should sit upright with the seat back in an upright position, centered on the seat cushion with their seat belt on, legs comfortably extended and their feet on the floor until the vehicle is parked and the ignition key is removed or the engine is shut off.